In January 2004, the New York Giants appeared to be a broken franchise. The team that had come tantalizing close to an NFL title in 2000 had once again begun to slip into mediocrity. It had been 13 years and three head coaches since the team’s sixth NFL title in 1990. And after a horrific 4-12 season in 2003, the Giants appeared far from ending their championship drought. The Giants had only made the playoffs four times since Bill Parcells quit and yet another coach had just been let go. On January 6, 2004, Tom Coughlin became the 16th head coach of the New York Football Giants. After he was introduced by then-General Manager Ernie Accorsi at his introductory press conference on January 7, Coughlin addressed the media. “My job is to convince these young men that with the parity that exists in this league today, the difference is in the preparation and that our formula will earn us the right to win,” said Coughlin, prophetically using the very words that would become the title of his book nine years later. The rebuilding process began in 2004 with the draft-day mega-trade for quarterback Eli Manning and the selection of Coughlin’s eventual son-in-law, guard Chris Snee, in the 2nd round of the NFL Draft. In free agency, the Giants added quarterback Kurt Warner, center Shaun O’Hara, and defensive tackle Fred Robbins. New York started the season 5-2, but after falling to 5-4, Coughlin decided to bench Warner and begin the Eli Manning era. Manning only won one game that season, the finale against the Cowboys, as the Giants finished the year 6-10. More pieces arrived in 2005. Wide receiver Plaxico Burress, right tackle Kareem McKenzie, and linebacker Antonio Pierce were signed in free agency. Cornerback Corey Webster, defensive end Justin Tuck, and running back Brandon Jacobs were drafted. Both co-owners, Wellington Mara and Bob Tisch, passed away from cancer within three weeks of each other during the season. The Giants surprised everyone by finishing 11-5 and winning the NFC East before being knocked out in the first round of the playoffs 23-0 by the Carolina Panthers. In 2006, the Giants added cornerbacks Sam Madison and R.W. McQuarters in free agency and drafted defensive end/linebacker Mathias Kiwanuka and defensive tackle Barry Cofield. Despite a second straight playoff appearance, the 2006 season was a disappointment. After starting 6-2, the Giants lost six of their last eight games and finished 8-8. They were one-and-done again in the playoffs, losing to the Philadelphia Eagles 23-20. 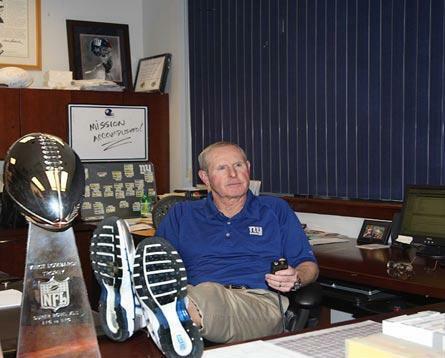 In just his third season, Coughlin was already on the hot seat and many wanted him gone. He was forced fire both his offensive (John Hufnagel) and defensive (Tim Lewis) coordinators. Mike Sweatman, the special teams coordinator, also retired. The 2007 New York Giants ended up being one of the most remarkable teams in all of sports history. Coughlin softened his approach and listened more to his players. New additions included kicker Lawrence Tynes, linebacker Kawika Mitchell, cornerback Aaron Ross, wide receiver Steve Smith, tight end Kevin Boss, and running back Ahmad Bradshaw. With a completely new set of coordinators on offense (Kevin Gilbride), defense (Steve Spagnuolo), and special teams (Tom Quinn), the team lost its first two games, won six straight, and looked very shaky down the stretch, playing .500 football in the last eight games, and barely making the playoffs for the third year in a row. Nobody – and I do mean nobody – gave the 10-6, #5 seed Wild Card Giants a shot at winning three straight road playoff games. Up until that point, in their entire history since 1925, the New York Giants had only cumulatively won three post-season away games. The “road warrior” Giants went on to double that total by defeating the #4 seed Buccaneers, #1 seed Cowboys, and #2 seed Packers before shocking the sports world by beating the AFC’s #1 seed, the “best team of all time” 18-0 New England Patriots in Super Bowl XLII. In a matter of a few games, Eli Manning developed into a true franchise quarterback. Coughlin became the fifth head coach in team history to win an NFL Championship, New York’s seventh overall. 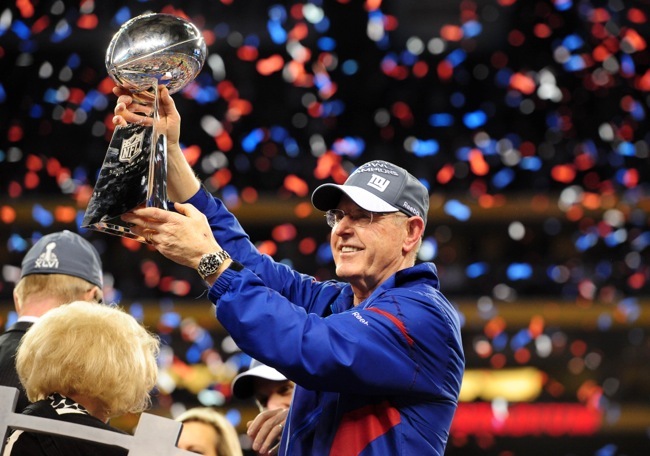 Coughlin’s best regular season with the Giants came in 2008 as the team went an NFC best 12-4 and won the NFC East. However, the Plaxico Burress shooting incident and mounting injuries derailed a team that had beaten both eventual Super Bowl participants, and the Giants were one-and-done in the playoffs against the Eagles again. The Giants missed the playoffs in 2009 and 2010 with 8-8 and 10-6 records and Tom Coughlin was once again on the proverbial hot seat. Spagnuolo departed and was replaced first by Bill Sheridan and then Perry Fewell. New additions during these three years included wide receivers Hakeem Nicks, Victor Cruz, and Mario Manningham; tight end Jake Ballard; defensive linemen Jason Pierre-Paul, Chris Canty, and Linval Joseph; linebacker Michael Boley; and safeties Kenny Phillips, Antrel Rolle, and Deon Grant. In 2011 came miracle season #2, so eerily reminiscent of the storybook 2007 campaign. Center David Baas and punter Steve Weatherford arrived in free agency. Foreshadowing future personnel problems, that year’s draft didn’t provide much help. Like 2007, the Giants started off 6-2, but struggled in the second half of the season. The Giants lost four games in a row and looked dead until saving their season by defeating the Jets and sweeping the Cowboys to win the NFC East. The Giants were terrible running the football (32nd in the NFL) and on defense (27th in the NFL), but the passing game led by Manning, Cruz, and Nicks carried the team to a 9-7 record, with six 4th-quarter comebacks. The #4 seed Giants then proceeded to beat the #5 seed Falcons, #1 seed Packers, and #2 seed 49ers, before dispatching the #1 seed Patriots, Tom Brady, and Bill Belichick for the second time in four years in Super Bowl XLVI. Coughlin became the third Giants coach to win multiple championships and the 13th NFL coach in history to win multiple Super Bowls. The 2012-2015 seasons were not kind to Coughlin as his team missed the playoffs each of his final four years in New York with 9-7, 7-9, 6-10, and 6-10 records. Poor drafting and numerous career-impacting injuries hollowed out the roster. Blowouts and heart-breaking 4th-quarter defeats mounted. Offensive and defensive coordinators were let go and many position coaches were fired with no improvement to the overall record. Approaching the ripe old age of 70, ownership decided to make a change. Alongside Steve Owen and Bill Parcells, Tom Coughlin is indisputably one of the greatest head coaches in the history of the New York Giants. Coughlin coached the Giants to a 102-90 regular season record and 8-3 post-season record. He had more wins in franchise history than any coach except for Owen, and tied Parcells for the most post-season wins in team history. In 12 seasons, Coughlin guided his team to five playoff berths, three division championships, two NFC Championships, and two NFL Championships. One-quarter of the team’s eight titles came under his helm. There was never a hidden agenda with Tom. His only goal was to make the New York Giants a winner. And with two of the most stunning playoff runs in sports history, Coughlin accomplished that objective. He was tough on his players, but in the end, they loved him for it. “It has been one of the greatest honors of my life and career to be led by Tom Coughlin; my life will forever be changed,” said current place kicker Josh Brown. If someone would have predicted in January 2004 that Tom Coughlin would win two Super Bowls in the next 12 years with the Giants, any fan of the team would have signed up for that deal in a heartbeat. Mission accomplished Coach Coughlin. You will always hold a special place in our hearts.